Two men have been jailed for life for the horrific killing of barman Jody Dobrowski on Clapham Common in south London in October 2005. It comes as a grim reminder to an increasingly confident gay community that the threat of homophobic violence remains one they cannot afford to ignore. The 24-year-old, originally from Gloucestershire, was targeted at the well-known gay "cruising" spot for no other reason than his sexuality. The attack was shocking in its violence, leaving Jody's body so badly battered he had to be identified by his fingerprints. Sentencing his killers, the Common Serjeant of London, Judge Brian Barker, said: "He suffered considerably before his death." Jody's killing was one of 1,306 homophobic crimes reported to police in London last year - and one of a string of attacks on Clapham Common. 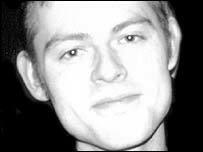 In September 2005 a gay man survived after being garrotted with a piece of wire by an attacker on the common. Two weeks later another man was beaten unconscious. Five months after Jody's murder yet another violent attack in the same area left a gay man with severe facial injuries and a broken leg. The problem is by no means confined to the capital. 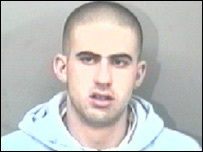 In July 2005 a 52-year-old man suffered facial injuries after he was kicked to the ground in Southampton. In December a gay priest, the Most Reverend Dr Barry Rathbone, was attacked with a metal baseball bat in a Bournemouth park. His attacker was later jailed for two years. There has also been a series of violent attacks in Londonderry. But these incidents were probably just the tip of the iceberg, say both the police and gay campaigners. While being homosexual no longer attracts the sort of stigma it did 20 years ago, lesbian, gay, bisexual and transgender (LGBT) people are still frequently the victims of hate crime, be it gay-bashings in public places or abuse in their homes by relatives or colleagues. Gay human rights campaigner Peter Tatchell says: "As many lesbians and gay men feel more comfortable about their sexuality, their increased visibility makes them vulnerable to being targeted by gay-bashing gangs. "Increasingly, gay and lesbian people want to be able to lead a free and relaxed life, without having to look over their shoulders in fear of homophobic abuse and attack. Sadly that isn't always possible." Even in openly gay communities, such as Canal Street in Manchester, or Old Compton Street in London, attacks take place - sometimes by gangs who go there deliberately to seek out victims. In some areas Mr Tatchell says the risk of attack means it is still not advisable to be openly gay. "Many gay people are still fearful of their safety on some white working class council estates and in some sections of the black and Muslim communities there are pockets of extreme prejudice. "This can make it quite unsafe for someone to be known to be lesbian or gay and extremely unsafe for them to hold hands with their partner or give them a kiss goodbye at the bus stop." Mr Tatchell says the typical attacker is young, poorly educated and unemployed, with their motivation stemming either from their religious background or from insecurity and fear about their own sexuality. In some cases, however, gays and lesbians may be targeted simply because they are seen as easy victims. Police say assaults are as likely to be carried out by opportunistic attackers as by gangs of organised homophobes. In many cases the homophobic element appears incidental to attacks rather than the sole motivation behind them. Gay men attacked in places such as parks and public toilets, for example, may not be "out" to their family and friends and are unlikely to go to the police for fear of exposure. The frequency of homophobic attacks is hard to quantify, as police forces are not obliged to compile figures. 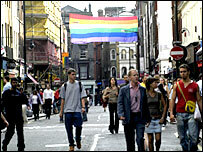 A 1999 study by the National Advisory Group found 66% of 2,500 respondents had been a victim of a homophobic incident. One thing police and campaigners agree on is that attacks remain hugely under-reported - one estimate puts victims coming forward at fewer than one in five. The traditional mistrust of police by the gay community is proving hard to shake off. Many fear they will not be taken seriously or treated sympathetically if they report an attack. Others fear having their sexuality exposed. Even attacks which are reported are notoriously hard to prosecute, partly because of the reluctance of victims to testify in court and of witnesses to come forward. Between April 2004 an March 2005, the Crown Prosecution Service prosecuted 317 cases identified as having a homophobic element, with a conviction rate of 71%. But 25% of cases were discontinued because the victim refused to give evidence, retracted it, or failed to attend court. Both the police and the CPS have been making a concerted effort to improve conviction rates and help witnesses give evidence in court. The CPS has appointed dedicated homophobic crime co-ordinator to make lawyers aware of the sensitivities involved and ways to make things easier - such as allowing witnesses to testify from behind a screen and reassuring the gay community. New rules mean judges must impose an extra sentence tariff in cases with a proven homophobic element. Sentencing Jody's killers Judge Barker told them: "You can only have had one intention when you went into the wood on Clapham Common and that was to engage in homophobic thuggery. "I am quite satisfied that aggression was uppermost in your minds. "It was Jody's tragic misfortune to cross your path. "You subjected him to mindless abuse and showed him no mercy. "It was a premeditated attack on a gay man. "As it continued and increased in ferocity there was an intention to kill. "One witness described your actions as like trying to kill an animal. "I have seen photographs of what was done to that young man. "One of the police officers described his face as like a bloody and swollen pulp." Police are also working closely with the gay community to encourage more victims to come forward. In London assaults can be reported using a third party system via LGBT community safety charity Galop. Other forces run initiatives such as reporting helplines. Galop's director, Tor Doherty, said the system was helping to break down the barrier between the community and police. Gay victims of crime are generally treated with far more sensitivity than they were in the past. But she said there was still a long way to go before the message has trickled down to every police officer. Ms Doherty told the BBC News website: "The police need to realise when a community's confidence is at stake an assault in the street is actually an attack on a whole community and it's really important to take it seriously." The Dobrowski case has been a success story, with the efforts of police and prosecutors resulting in the attackers being jailed less than 10 months after the murder. But there is still a long way to go in ending the scourge of violent homophobia. Have the police overcome gay prejudice?